With the fog still lingering here in Swindon I found some time to blog about Islay, where it's hopefully sunny. If it is sunny it's probably not the time to stay indoors and quilt or cross stitch (unless you can also do it outside, I must admit I don't really know), nevertheless this entry is about just that. 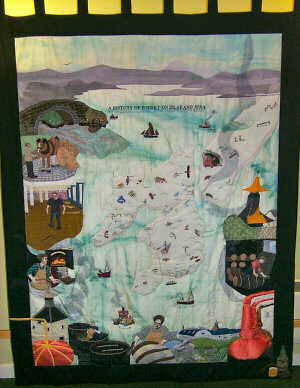 The picture on the right shows a quilt displaying the history of whisky making on Islay and Jura. I took the picture in 2000, I think during a visit of Laphroaig distillery where it was on display back then. The quilt was made by Islay Quilters and was bought by Bowmore Distillery. The whisky wallhanging was the second wall-hanging completed by the group, who now have a workshop in Islay House Square where you can visit them. They will also have an exhibition soon: 19th-25th July 2006 in Ballygrant Hall. From quilting to cross stitching: Mearnscraft offer an Islay cross stitch kit or chartpack, you can also get one for Jura. Both let you stitch a map of the island with some of the various landmarks like villages, distilleries and lighthouses. PS: I hope the title of this entry is appropriate and both quilting and cross stitching fall under needlework? I don't know much about either, but still thought it was worth writing about and had to give it a title. Update: Rae from Islay Quilters has now told me that it is possible to quilt outside in the sun, you just need a long enough extension lead for the sewing machine.